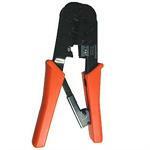 Modular Crimper (RJ11, RJ45, WE/SS Style). Crimps AWG 28-24 telephone and data cables, crimps 4 & 6 position RJ11, 4 & 6 position RJ12, 8 position RJ45, embeddedflat cable cutter and stripper. All-in-one modular crimping tool for precise crimping of phone or data plugs.